FLUFFY DONUTS, FLUFFY DONUTS, FLUFFY DONUTS!!!!! 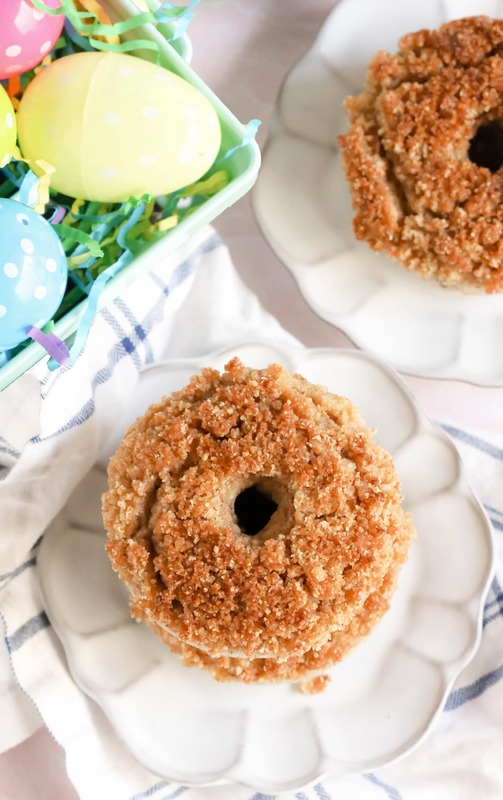 Okay, so now that I have your attention… 😉 I want to introduce you to your new favorite dessert: these gluten-free Baked Crumb Donuts! These donuts are so soft and light, it’s like biting into a cloud. These Baked Crumb Donuts are sweet, cakey, and ultimately satisfying. You’d never know they’re gluten-free, high in protein and fiber, and made with less sugar than regular donuts! I can resist some sweets, but this?? Psht. Yeah right. Hand me a plate of donuts and they are a goner. I will eat ’em nonstop. If you try to take donuts away from me I will growl at you. 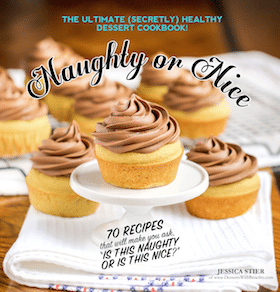 I love that this recipe uses healthier ingredients, especially compared to regular donuts. Donuts — whether they’re frozen or store-bought or bakery-bought — almost always contain ingredients such as hydrogenated oils, high-fructose corn syrup, bleached flour, and artificial flavorings. But not these bad boys! 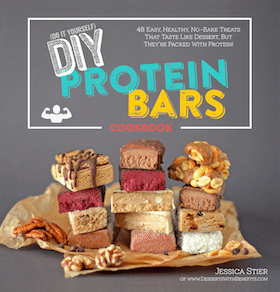 In this recipe, we swap those ingredients with healthier options. In the donuts, we use Greek yogurt instead of margarine or shortening (which are full of trans fats), and in the crumb topping we use a couple pats of real butter (I use organic, unsalted butter). Yogurt works incredibly well as a butter/oil substitute since it yields a super moist baked good, but without all the extra calories and fat. 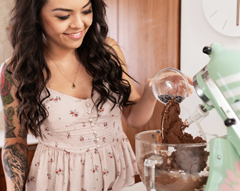 By using a blend of coconut flour, almond meal, and ground flaxseed, we can swap out the bleached white flour entirely! Coconut flour is light and fluffy, almond meal adds a great texture, and the ground flaxseed helps bind everything together, since coconut flour and almond meal tend to be a bit crumbly when used without a binder of some sort. I sweetened the donuts by using the Truvia Cane Sugar Blend, which is a blend of natural cane sugar and stevia leaf extract. Just ½ cup sweetens like 1 cup of sugar, but with 75% fewer calories per serving than cane sugar! On top of the sweet, vanilla-flavored donuts is the most perfect crumb topping you can imagine. It’s that extra “oomph” of richness from the butter, flavor from a bit of ground cinnamon, and sweetness from the Truvia Brown Sugar Blend, which has the texture, moisture, and taste of brown sugar, also with 75% fewer calories than brown sugar! 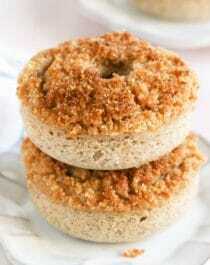 These Baked Crumb Donuts don’t taste like a healthier treat at all. Shhh, let’s keep that a secret! No need for the white flour and excess sugar to make these donuts. Best of all, no need to deep fry! 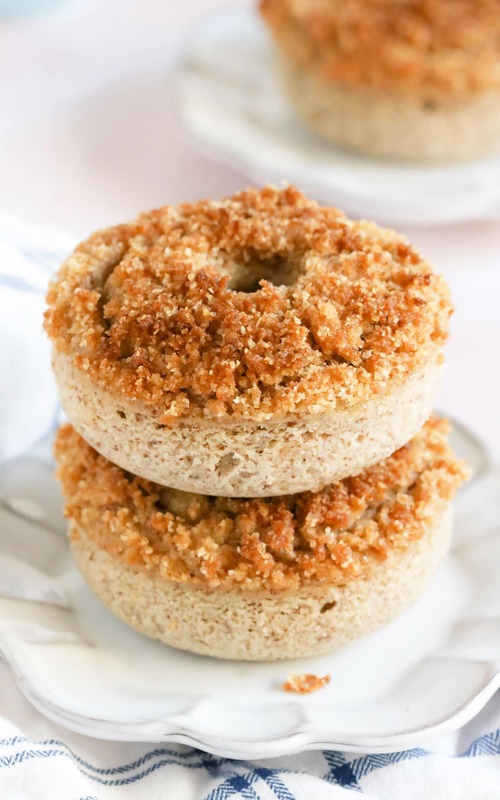 These easy Baked Crumb Donuts are rich, sweet, full of vanilla flavor, and a coffee cake-like crumb topping. Every bite is buttery and satisfying. You’d never know they’re gluten-free, high in protein and fiber, and made with less sugar than regular donuts! 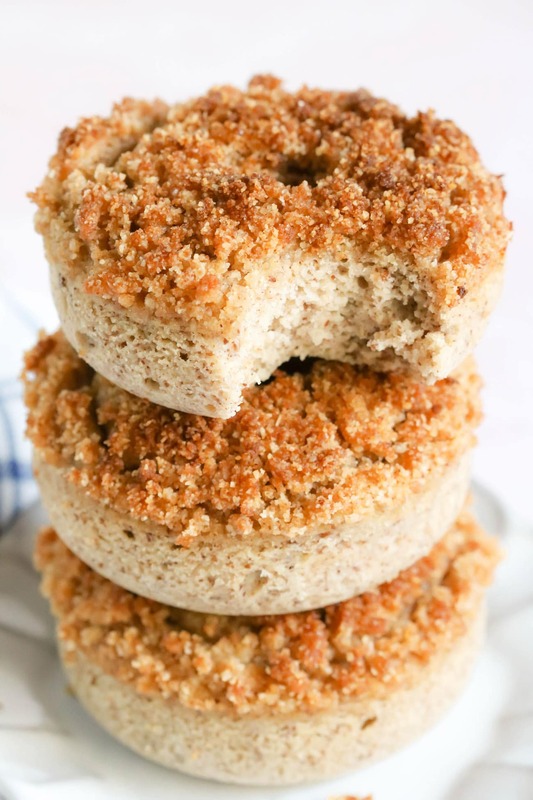 These easy Baked Crumb Donuts are rich, sweet, full of vanilla flavor, and a coffee cake-like crumb topping. You'd never know these donuts are gluten-free, high protein, high fiber, and made with less sugar! Preheat the oven to 350 degrees Fahrenheit and place a silicone donut pan on a baking sheet. In a large bowl, whisk together the yogurt and eggs. Whisk in the Truvia Cane Sugar Blend and salt, then whisk in the vanilla extract. Whisk in the flax, and then whisk in the almond meal. Add the coconut flour and baking powder and whisk thoroughly. Scoop the mixture into a piping bag and pipe the batter into 6 donut molds. 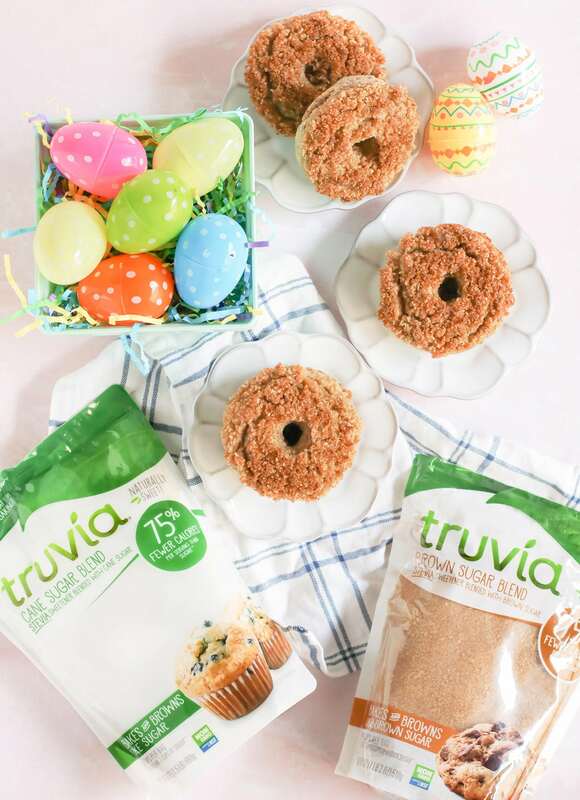 For the Crumb Topping- In a medium-sized bowl, whisk together the almond meal, Truvia Brown Sugar Blend, and cinnamon. Use a fork to mix in the butter. Sprinkle the mixture over the piped donuts. Gently pat the crumb mixture a few times so it sticks to the batter. Bake for 30 minutes. Let cool completely, then place the pan in the freezer for about 1 hour. This helps the donuts come out of the pan easily. Serve chilled or serve warm, depending on what you’re in the mood for, and enjoy! Adapted from Joy Filled Eats. Now that’s a breakfast-worthy dessert if I do say so myself!